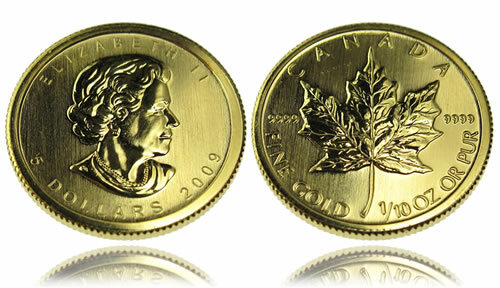 The Canadian Maple Leaf Gold Bullion Coin has been offered by the Royal Canadian Mint since 1979. Initially, the strike was available in only the one ounce size, but in the years that followed, additional fractional sizes were added. Today, in addition to the One Ounce Gold Maple Leaf, the Royal Canadian Mint also produces 1/2 ounce, 1/4 ounce, 1/10 ounce and 1/20 ounce sizes. Each of them are composed of 99.99% fine gold, or 24-karat, and they carry a Canadian face value of $50, $20, $10, $5 and $1. When the strikes were first introduced, they were one of only two gold bullion coins routinely produced in the world. The other was the South African Krugerrand which debuted itself some twelve years earlier. However, in the time since, the Gold Maple Leaf has become one of the most popular bullion pieces aided, in part, by the fact that each coin is guaranteed for weight and purity by the Government of Canada. The Royal Canadian Mint states that since introduced, it has sold more than 20 million troy ounces of the Gold Maple Leafs. It also acknowledges that the Maple Leafs were the first world bullion product to be struck from .9999 fine gold. Its popularity also spawned the releases of similar maple leaf products struck from other precious metals including the Silver Maple Leaf, the Platinum Maple Leaf and the Palladium Maple Leaf. As legal tender of Canada, the coins feature a portrait of Queen Elizabeth II of England on its obverse. Surrounding her are inscriptions indicating her name, the face value of the strike and the year of minting. The reverse contains the maple leaf design from which the strikes take their name. Inscribed on the reverse are CANADA, the size of the coin and 9999 FINE GOLD.